130 years ago this month, the Home and Hospital for Jewish Incurables, Tottenham was founded. To mark this occasion we take a look at the material we hold relating to the institution (MS 284). This struck a chord with Morris Barnett, who wrote to the Jewish Chronicle in October 1888, asking for those interested in “founding a home for incurables” to contact him. This led to a meeting held at his house in February 1889, where a public meeting was arranged to inform the community of the creation of the Society for the formation of a Jewish Home for Incurables. At the public meeting, a committee was elected and over 400 people promised to be subscribers. The first Home opened in 1891 at 49-51 Victoria Park Road, E9, with nine patients. Its object was the care, maintenance and medical treatment of United Kingdom residents of the Jewish faith with a permanent disability. Under the rules of the Home, patients had to be of the Jewish Faith, who had resided in England for 5 years, and it was open between 11am to 6pm for the inspection of the public. In the early 1890s the average weekly cost was 21/ per patient. Concerts, annual poultry dinners, were provided for patients, as well as lectures and film showings. The Institution was managed by a Committee of Management consisting of the President, Vice-Presidents, Treasurers, Honorary Secretary, Honorary Solicitor, Honorary Medical Staff, and other Honorary Officers deemed necessary. The Committee met once every quarter, and were responsible for receiving correspondence from medical staff, approving accounts and purchase orders, appointing a matron, nurses and servants; and regulating the household management of the institution and the patients. The latter was done through the appointment of a House Committee that consisted of ladies annually elected, who met once a month and visited the Home periodically to inspect the interior management and domestic arrangements. They were also responsible for checking that patients were receiving adequate treatment, and reported their observations and suggestions in a book laid before the Committee of Management. Responsible for the entire charge of the home, the Matron kept accounts, appointed or suspended nurses of domestic servants, and arranged leave of all staff. Menus of the day were arranged with the Housekeeper and medicines ordered by the doctor were dispensed with the Assistant Matron. The Matron was in charge of receiving all visitors, and in general, carried out the instructions of the Board of Management and Medical Officers. The Institution’s first matron was Esther Goldberg. Funding for the institution was achieved by subscriptions, donations, and payments made by patients and members of the public. In the beginnings of the institution, “the first funds were raised in London’s East End Streets by carrying a mock patient in a bed around in a cart and appealing for subscriptions of one penny per week.” [MS 284 A978/6/2] Events were also organised to raise funds for the institution, such as annual balls, garden fetes, and dances. After building work at this site, the Home was formally opened on 3 July 1903 by Princess Louise, Duchess of Argyll (sister of King Edward VII). Up to 80 patients were admitted, with male patients on the ground floor, where there was also a concert hall and access to a garden, and the female patients were on the first floor. Staff and kitchen quarters were located on the third floor. A new wing was completed at the Tottenham Home in 1913 and a new synagogue was opened in 1914. In 1918, the Home was approached by the Ministry of Pensions seeking to use the new wing to accommodate Jewish soldiers. A scheme was agreed whereby twenty-eight soldiers were admitted for twelve months. In 1939 fear of air raids led to the evacuation of the Home to Chesterfield House near Saffron Waldon. The accommodation at Tottenham was taken over by Middlesex County Council in May 1940 to accommodate refugees. In 1963, the institution’s name changed to Jewish Home and Hospital. With 114 patients in 1974, the Jewish Home and Hospital provided a much-needed service in north London. Patients who came in chair-bound were helped to walk again, and other patients who would otherwise be home alone suffering the expense of nurses coming to wash and feed them, could be somewhere where they could make friends and be cared for at the same time. Physiotherapy and occupational therapy was provided, as well as facilities such as dentist and a hairdressing salon. Rooms were provided for crafts, and prayer and meditation. Being in a home where you could mix with Jewish patients and practise religious activities was of pivotal importance for the patients. “When you’re not well, you like to be near God, like a child. They haven’t got a cure yet, so you want to die in a Jewish place.” (Judith, Jewish Chronicle Supplement, 20 September 1974 [MS 284 A978/7/6]). In 1992, the Home merged with Jewish Care. By the late 20th century, Tottenham’s Jewish population had largely moved away and the building became obsolete. The Home closed in 1995. Consisting of 24 boxes and 5 volumes, the MS 284 collection contains minute books; annual reports; legal and financial papers; correspondence; and photographs. The material provides a valuable resource for research into nineteenth and twentieth century Jewish community services for the disabled. Held annually on 8 March, International Women’s Day celebrates the social, economic, cultural and political achievements of women throughout history and across nations. The Special Collections at the University of Southampton holds material for a range of women whose contribution in many spheres is worthy of mention. 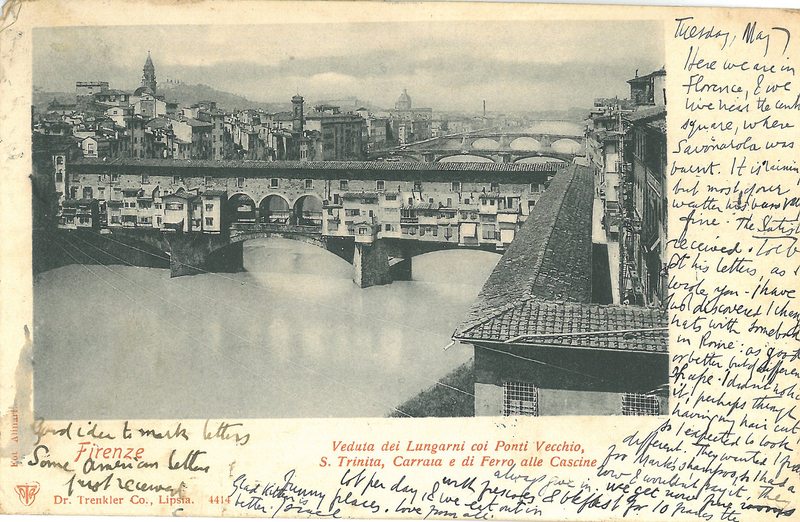 For this blog we will focus on Edith “Edie” Noble, née Davidson or Davidovitz (MS 381). Born in Hull in 1910, she was one of nine brothers and sisters born to Annie and Hyman Davidovitz. She and her two sisters, Sophie and Min, married three London-born brothers, Ziggy, Charles and Bernard Noble. Edie and her husband Charles joined South London Liberal’s Synagogue in 1939, a year after they married. Edith was heavily involved with the South London Liberal Synagogue, holding the position of Treasurer in the Women’s Society and as a member of their Council. Passionate about promoting friendly relations among Jewish women, Edith became a founding member of the Streatham Group of the League of Jewish Women as its Vice-Chairman in 1953. A year later, as group representative, Edith was elected to the League’s National Council. She went on to become founder Chairman of the League’s Publicity Committee in 1957 and National Honorary Secretary in 1961. As the League’s first Extension Officer, Edith worked tirelessly to ensure the organisation was reaching Jewish women all over the country, opening 25 UK groups and achieving thousands of new members between 1967-72. Edith held many positions in the League of Jewish Women, including President in 1973, as well as positions in the International Council of Jewish Women (ICJW) and the National Council of Women. This reflected her commitment towards raising the profile of these organisations, and strengthening connections between Jewish women nationally and internationally. Using her links around the world, Edith succeeded in widening the communication net of these bodies, such as by setting up the 13th International Convention for ICJW in Bournemouth in 1984, which she chaired. Keen for women to keep well-informed of social issues, Edith was the League representative on the Women’s Consultative Council, a government sponsored forum, from 1961. In 1969 this group became the Women’s National Commission, a body that still enables the government to obtain women’s thoughts on current issues. Alongside these committee positions, Edith also completed welfare work, which included visiting patients on a Thursday morning at the Birchlands Jewish Hospital, serving tables at the South London Day Centre, and hosting and supporting Jewish girls who came to England from Morocco and Iran to work in the London Jewish Hospital. The correspondence, working notebooks, papers and other documents relating to the Jewish Women’s organisations that Edith was involved in, provides a wealth of information on the work of the League of Jewish Women and International Council of Jewish Women from a committee member’s perspective. The motives behind this decision were various. Aside from a belief in the righteousness of the Zionist cause, it has been suggested that British leaders hoped the declaration would help gain Jewish support for the allies in neutral countries, such as in the United States of America or Russia. Great Britain and France were mired in a stalemate with Germany on the western front by 1917 and all efforts to defeat the Turks had failed. They feared that the war might be fought to a draw. Lloyd George also had come to see British dominance in Palestine as an essential post-war aim and felt that the establishment of a Zionist state, under its protection, would accomplish this. I have much pleasure in conveying to you on behalf of His Majesty’s Government, the following declaration of sympathy with Jewish Zionist aspirations which has been submitted to, and approved by, the Cabinet. Among the Special Collections, the collection MS 144 contains papers relating to the Balfour Committee, formed for the purpose of convening a conference of Anglo-Jewry to consider means of furthering the policy laid down in the Balfour Declaration. The collection contains a book of committee minutes, dating from 17 Dec 1917 – 26 Oct 1918; correspondence of A.M.Hyamson, honorary secretary of the committee, 1917-18, including correspondence with Dr Israel Abrahams; together with statements for the press, drafts of heads of scheme, and copies of memoranda, including proposals for Jewish settlement of Palestine, some signed by members of the committee. This week’s blog post looks at two volumes from the manuscript collections relating to Sir David Salomons, baronet, and his nephew and heir, Sir David Lionel Salomons, second baronet. The first volume (covering the period 1819-1911) initially consists of items relating to Philip Salomons and other members of the Salomons family. Philip Salomons was Sir David Lionel’s father, with the material pertaining to his application for citizenship to the United States (he became a naturalized citizen in 1826) and his appointment as Deputy Lieutenant for the County of Sussex in 1952. This is followed by a more substantial range of material relating to Philip’s brother Sir David Salomons, first baronet, primarily concerning his appointment as Lord Mayor of the City of London. David Salomons was born in London on 22 November 1797. He was the second son of Levy Salomons, a stockbroker, and Matilda de Metz. Following in his father’s footsteps, he pursued a career in banking and in 1832 became one of the founders of the London and Westminster Bank. Alongside a successful banking career he had a distinguished public career. In 1835 he was elected as Sheriff of the City of London. However, as a Jew, he was unable to enter office due to the mandatory oath of office including Christian statements of faith. Parliament was obliged to legislate and following the passing Sheriffs’ Declaration Act later in the year, he was able to take up the post. 1835 also saw him elected as an Alderman of the City of London. Again, he was unable to take up the post due to the oath of office. On this occasion the law was not changed. It wasn’t until 1847 and the passing of the Religious Opinions Relief Act that he was finally admitted as a City alderman, and in 1885 became the first Jewish Lord Mayor of London. Salomons was elected a Member of Parliament for Greenwich in 1851. While the law had now changed to enable professing Jews to hold municipal office, they were still denied admission to parliament. This time, rather than refusing to take the oath (as he had done in 1835) Salomons merely omitted the Christian statements of faith and took his seat on the government benches. He eventually agreed to withdraw, but only after voting in three divisions of the House. He lost his seat the following year at the general election of 1852. It wasn’t until the passage of the Jews Relief Act in 1858 that he was permitted to take his seat without further demur in 1859, serving as the constituency’s M.P. until his death in 1873. Salomons was created a baronet in 1869. 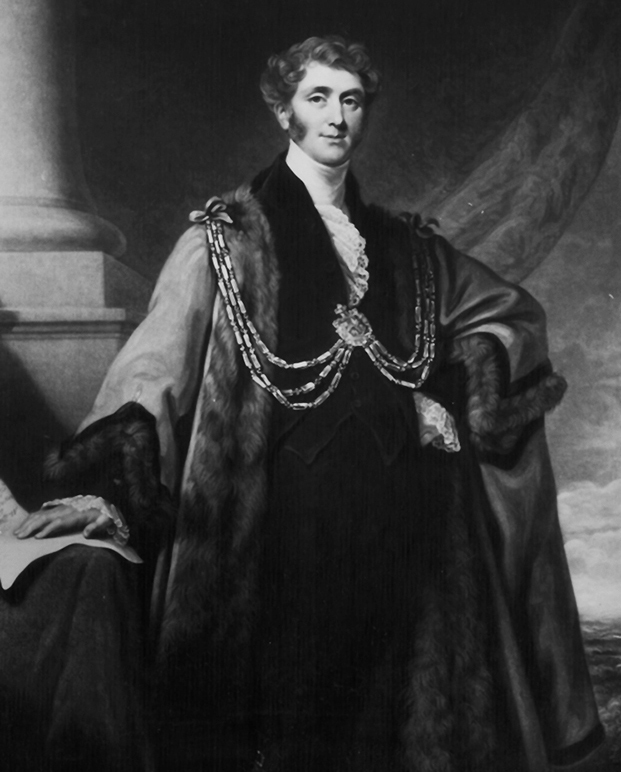 While he was married twice, there were no children of either marriage and his estate and titles passed to his nephew, Sir David Lionel Salomons. The majority of material in the volumes relates to Sir David Lionel Salomons. 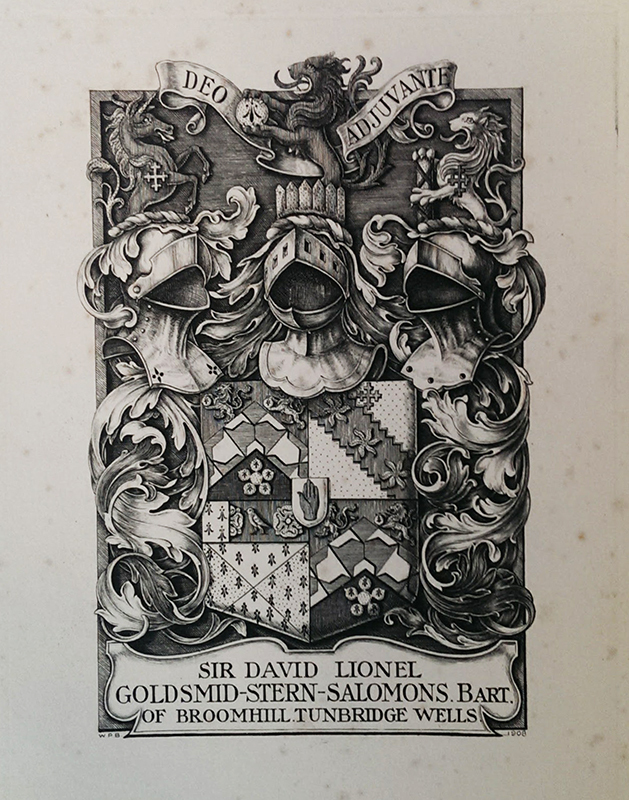 Sir David Lionel was the son of Philip Salomons (noted above) and Emma Montefiore. Following the death of his mother in 1859, and father in 1867, he was brought up by his uncle. On the death of his uncle in 1873, he succeeded as second baronet (by special remainder) and inherited the estate of Broomhill, north of Tunbridge Wells. He studied at University College London and at Caius College, Cambridge, before being called to the bar at the Middle Temple. His inheritance from both his father and uncle meant that he was financially secure and was able to pursue scientific and other interests, becoming an inventor who pioneered developments in motoring and electricity. In addition to publishing a range of works on scientific subjects, he had workshops and laboratories added to the house at Broomhill (one of the first houses in the country to have electric lighting). Lecture 2. 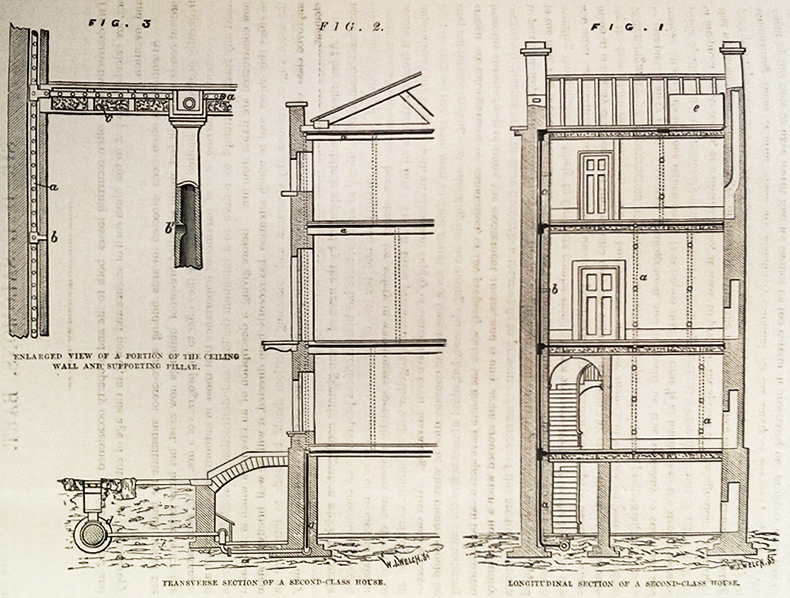 Statical Electricity continued.–Galvanic Electricity, and modes of producing the latter. –Comparisons between Statical and Galvanic Electricity. Induction. Lecture 3. Resistance explained. Some applications of Electricity. Lecture 4. Applications of Electricity continued, and the Telegraph. Lecture 5. The Electric Telegraph. Salomons also had a keen interest in motor vehicles and was an early pioneer for the car on British roads. He was a member of the Automobile Club of France, the Royal Automobile Club of Great Britain, as well as a range of other automobile clubs, and organised the first British Motor Show (named the Horseless Carriage Exhibition) at Tunbridge Wells in 1895. Salomons married Laura de Stern in 1882 and the couple had one son and four daughters. Their only son, David Reginald Salomons, died at Gallipoli when HMS Hythe carrying his company was sunk in a collision. Following Sir David Lionel’s death on 19 April 1925 the baronetcy became extinct. Today marks International Women’s Day which celebrates the social, economic, cultural and political achievements of women throughout history and across nations. The Special Collections at the University of Southampton holds material for a range of women whose contribution in many spheres is worthy of mention. For this blog post we will focus on Gladys Helen Rachel Montagu, Baroness Swaythling (MS 383). Born in Belfast, Northern Ireland, in 1879, she was the eldest daughter of Colonel Albert Edward Williamson Goldsmid, MVO, and Ida Stewart Beauclerk Hendricks. In 1898 she married Louis Montagu, the eldest son of Samuel Montagu, first Baron Swaythling (MS 117), founder of the banking firm Samuel Montagu and Company. Louis succeeded as second Baron Swaythling in 1911 and inherited the office of president of the Federation of Synagogues (MS 248), an organisation created by his father to promote the acculturation of Jewish immigrants. Following their marriage they lived at Townhill Park House, Southampton, purchased by the first Baron Swaythling in 1897. Originally dating from the 1790s, they had the house extended and re-designed by architect Leonard Rome Guthrie in the Italianate style. Guthrie also designed the terraced gardens to complement the style of the house, with the plants laid out by the renowned garden designer Gertrude Jekyll. As Lord and Lady Swaythling they were leading members of the Anglo-Jewish community and leading figures in English society, hosting dinner parties and other social events at Townhill Park where visitors included Princess Alice and Queen Mary (with whom Lady Swaythling had a lifelong friendship). They were also active communal workers, with Lady Swaythling applying much of her energy to the local Southampton area. During the First World War she became President of the Women’s Southampton branches of the Auxiliary of the YMCA and Women’s Emergency Corps, as well as the War Hospital Supply Depot, Southampton. In addition, she served on eighteen different committees, including as chair of the Wounded Allies Relief Committee, established for the provision of convalescent homes for wounded Belgian soldiers. Country houses were required for medical use as the large numbers of wounded meant there were not enough hospitals able to cope with the seriously disabled or even those simply convalescing. These houses were pressed into service or were donated for the purpose, as their clean country air and fine grounds were considered most helpful to rest and recuperation. Allington Manor, a country house in Eastleigh owned by the Swaythlings, was one of the houses donated as a military sanitorium. Lady Swaythling took a deep interest in the welfare of the sanatorium and would sing to the patients during her visits. Later, she was involved in organising hospitality for American soldiers and sailors, with her efforts leading to her becoming known as the “British godmother” among American naval enlisted men. Other activities included working on the executive committee of Queen Mary’s Governess’ Home in Surrey, and assisting the British Women’s Patriotic League. After the war she continued her communal actives, with her roles including President of the Southampton Hostel for Unmarried Women and the Southampton branches of the National Society for Combating Venereal Diseases and the University Extension Lectures movement. 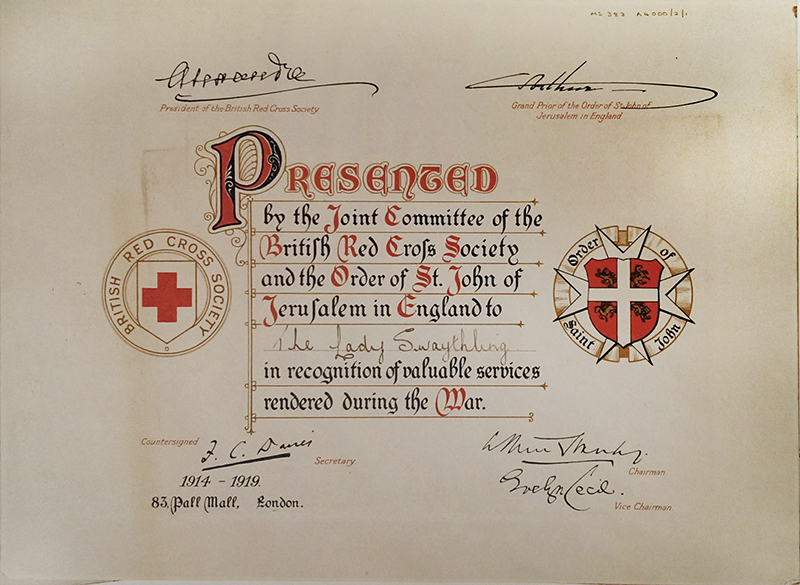 She was also chair of the conjoint committee of the British Red Cross and the Order of St John of Jerusalem. In 1919 she joined the Council of the Anglo-Belgian Union and continued to support Belgian exiles during the Second World War. She was an active supporter of refugees throughout her life and, in 1925, addressed a letter to President Coolidge pleading for the admission to the United States of Jewish refugees stranded in Southampton. Other public offices she held included President of the Electrical Association for Women, established in 1924 to interest women in the electrical development of the country; Honorary President of the Jewish Lads’ Brigade (MS 244), a Jewish youth organisation founded by her father in 1895; President of the Southampton branch of the Girl Guides Association; and Vice-President of the NSPCC (National Society for the Prevention of Cruelty to Children). She travelled widely, touring countries such as India, Australia, China, Japan, the United States, and Canada, and was the recipient of many overseas honours. She was made OBE in 1953. Lord and Lady Swaythling had had three sons and a daughter. Their eldest son Stuart became the third Lord Swaythling in 1927 on Louis’ death. The family continued to live at Townhill Park until 1939 when the house was handed over to the Red Cross and used as a convalescent home for British and American soldiers during the Second World war. 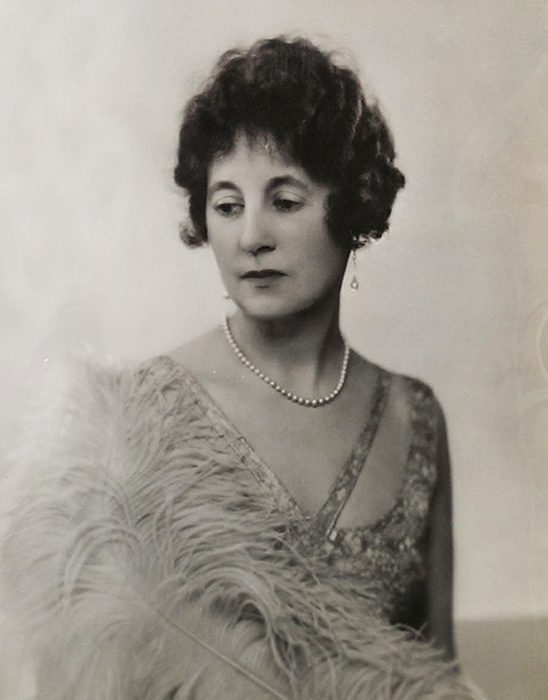 Lady Swaythling died in 1965 at the age of 85. 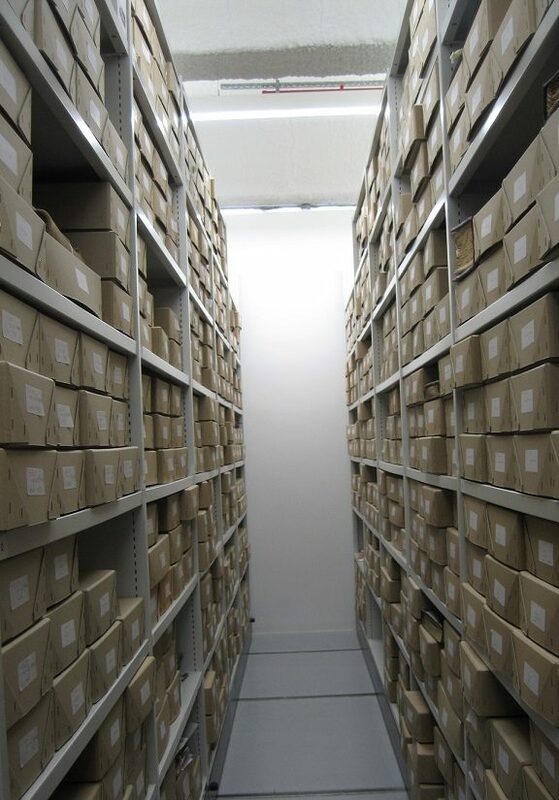 Totalling several thousand boxes of material, the collections MS 301-400 provide an incredibly rich and diverse research resource. A significant proportion of the collections have some Anglo-Jewish focus, complementing the extensive Anglo-Jewish Archives already held at Southampton, but overall they have a broad thematic sweep. Alongside those of Jewish organisations, such as notable collections for the Reform Synagogues of Great Britain (MS 302) or the Leo Baeck College, London (MS 316), are a range of material for individuals and families, such as Chief Rabbi Hermann Adler, Sir Robert Waley-Cohen, the Henriques family, Dr Schenier Levenberg and William Frankel, who was editor of the Jewish Chronicle, to name but a few. It is particularly pleasing to note that there has been a slight increase in the number of collections reflecting the lives and work of Jewish women. 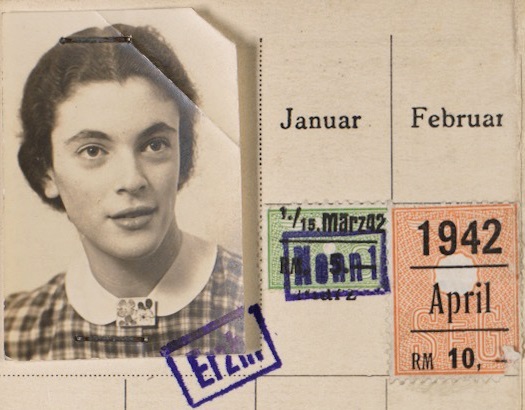 These range from the archive of Marianne Ellenbogen (MS 324), a German Jew who escaped incarceration by the Nazis after her family were arrested in Germany in August 1943 and went on the run spending two years travelling across Germany, to Trude Dub, Leicester correspondence of Jewish Chronicle (MS 325), Dr Asenath Petrie, psychologist and poet (MS 349) and papers of Gladys, Lady Swaythling (MS 383). 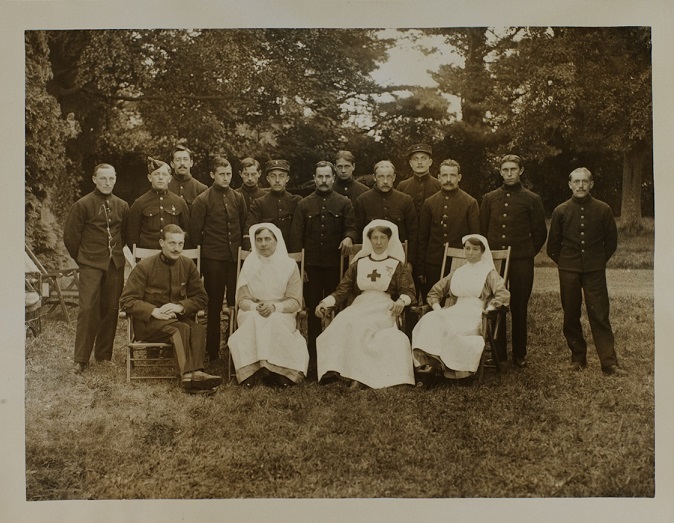 Amongst papers of Lady Swaythling relating to her voluntary and philanthropic work, is material for the Wounded Allied Committee and Belgian refugees at Allington Manor, a home of the Swaythlings that was donated as a military sanitorium during the First World War. The collection also includes much relating to social events, and contains dinner books kept by Lady Swaythling that provide a wonderful insight into the etiquette, diet and arrangement of dinner parties in the interwar years. There are a number of small, but significant, collections that complement the papers of the first Duke of Wellington held by the University. The correspondence of Wellington to Sir John Malcolm (MS 308) was used in the compilation of Wellington’s Dispatches and fits perfectly with a second collection, that of the papers of Lieutenant Colonel John Gurwood (MS 321), who was the editor of the Dispatches. Gurwood served under Wellington during the Peninsular War and distinguished himself leading the forlorn hopes at the storming at Badajoz and Ciudad Rodrigo. His archive includes material on his military service, including letters to his mother, 1810-12, alongside the papers relating to his work for Wellington compiling the Dispatches. Another interesting Wellington related collection (MS 351/6) contains the scrimshaw nautilus shell, engraved by C.H.Wood, depicting Wellington on one side and St George slaying the dragon on the other, produced in the 1850s, together with a number of Peninsular War and Waterloo related illustrations. 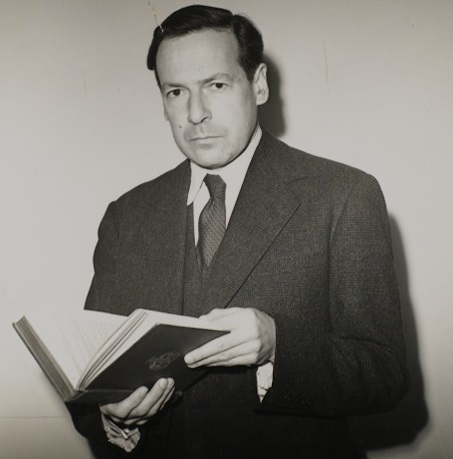 The papers of Alan Campbell-Johnson, a public relations specialist, who in February 1947 became the first and only press attaché to a Viceroy of India, represent a significant addition to the material held within the Broadands Archives (MS 62). Campbell-Johnson accompanied Lord Mountbatten for the transfer of power to the newly independent India and Pakistan and remained with Lord Mountbatten, while Mountbatten was the first Governor General of India. Campbell-Johnson sustained a connection with Mountbatten for the remainder of his life and his archive provides an insight into the management of the presentation of partition to the media and, in the long term, in the managing of historical reputation. Frank Templeton Prince was at one time a professor of English at the University of Southampton and his archive (MS 328) is just one of a number of collections with connections to the University. Prince was a poet of some renown, probably best remembered for his collection Soldiers Bathing (1954), the title poem of which is one of the most anthologised poems of the Second World War. He was admired by and influenced the New York school, a group of writers that flourished in the 1960s. His work has been somewhat overlooked more recently, however, and the archive has been a major resource in a reassessment of Prince’s poetry and legacy. Finally, we turn to the Montse Stanley Knitting Collection. 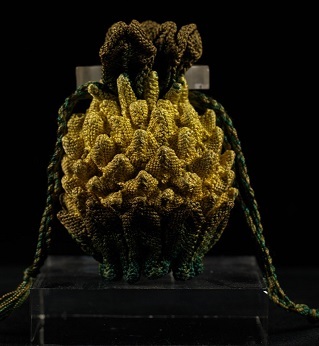 Montserrat Bayés Sopena was committed to bringing to a wider audience both creative knitting and the history of knitting. The Montse Stanley Knitting Collection at the Hartley Library comprises her working papers, photographs, postcards and illustrations (MS 331) together with a wide range of over 800 knitted objects and garments and small tools and sample yarns (MS 332): an invaluable resource for all aspects of knitting as well as for social history. Printed material from the Montse Stanley collection now forms part of the Knitting Reference Library at the Winchester School of Art Library. We hope that you enjoy looking through the catalogue descriptions and perhaps find that serendipity moment when you make a delightful discovery of something unexpected. 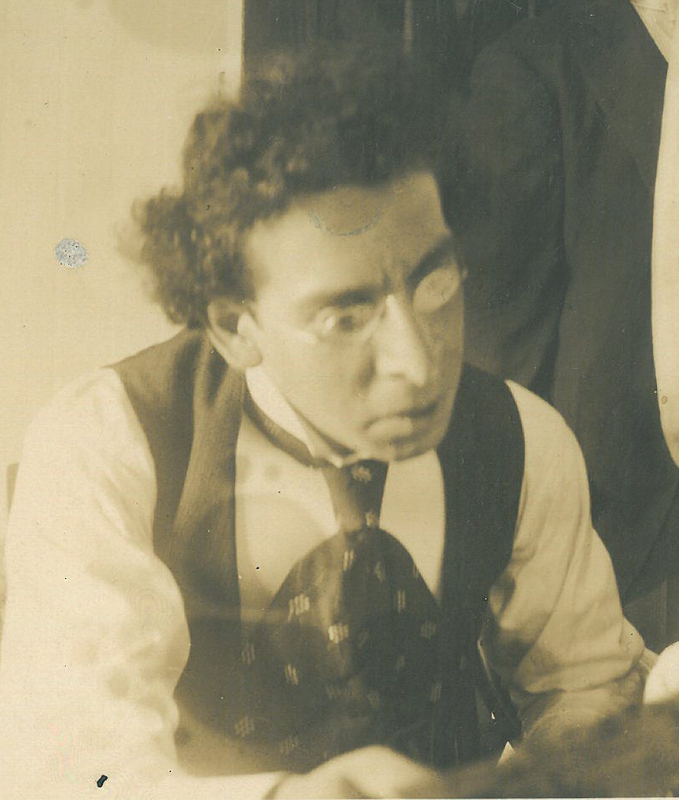 Today marks the 90th anniversary of the death of Israel Zangwill. He was a British author at the forefront of cultural Zionism during the nineteenth century. Born in London in 1864 to Jewish immigrants, Zangwill was educated at the Jews’ Free School where he later became a teacher. 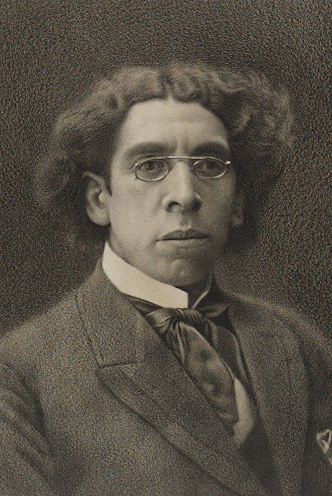 He produced numerous poems, plays and novels including The Children of the Ghetto: a Study of a Peculiar People (1892) and The King of Schnorrers (1894). His play, The Melting Pot (1908) about a Russian-Jewish immigrant family, popularised this metaphor used to describe American absorption of immigrants and his work earned him the nickname the “Dickens of the Ghetto”. Harry Ward, secretary to the Golders Green Synagogue, was a founding member and honorary secretary of the Israel Zangwill Fellowship. 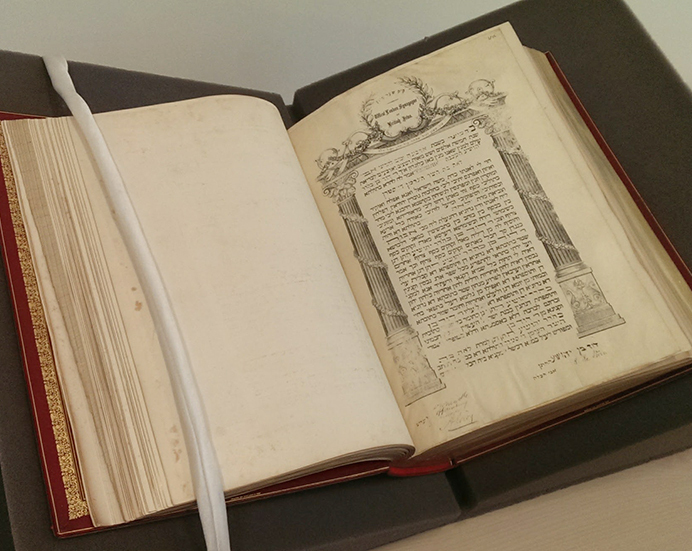 He spent 60 years collecting a vast library of Zangwilliana, now in the University’s Special Collections [MS 294]. Collected over Ward’s lifetime, the material includes Zangwill correspondence – for example with his lecture agent, Gerald Christy, 1895-1906 – as well as Ward’s own correspondence and research papers. Ward’s comprehensive collection of books by Zangwill, or in which he is mentioned, was added to the Parkes Library. Another smaller collection of papers is that of Ruth Phillips, secretary to Lucien Wolf and Israel Zangwill [MS 116/5]. Zangwill died in 1926 in Midhurst, West Sussex. In celebration of his life, the Jewish Museum, London has created Zangwill’s Spitalfields, an audio-visual walking tour of the historic Spitalfields area of London’s East End.